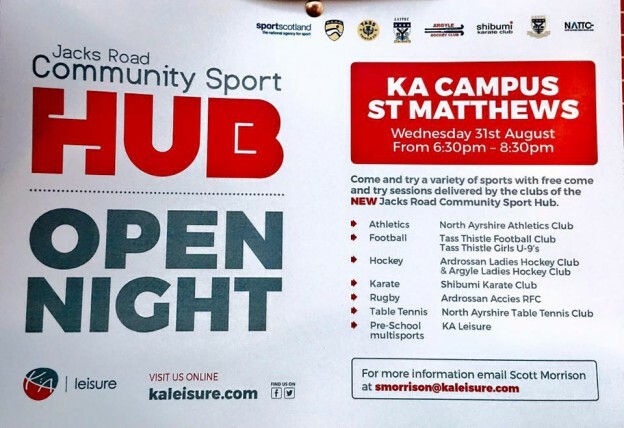 Jacks Road Community Sports Hub Open Night will be held at K:A Campus St Matthews on Wednesday August 31st. From 6.30pm – 8.30pm everyone is welcome to come and try a variety of sports with free come & try sessions delivered by ourselves and all the clubs of the NEW Jacks Road Community Sports Hub. North Ayrshire TTC, North Ayrshire Athletics Club, Ardrossan Accies RFC, Tass Thistle Football Club, KA Leisure, Ardrossan Ladies Hockey Club & Argyll Ladies Hockey Club are the local sports club involved.